When the Holiday season comes around, it is essential to pick the perfect card, border, or background. But, you might find yourself unable to choose one after scrolling through thousands of design options. If you fall under this category, don’t worry! 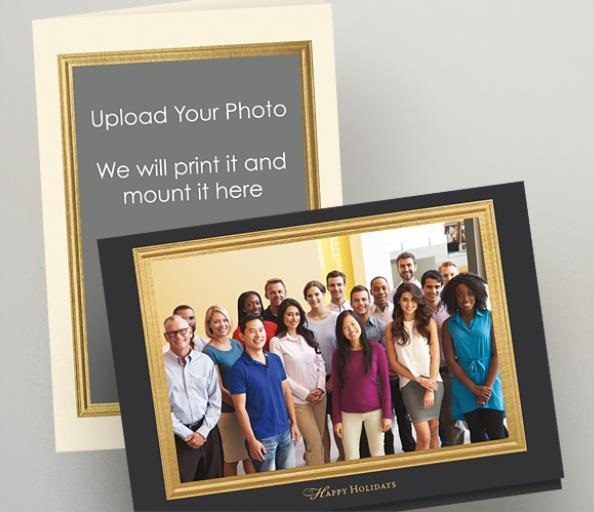 You could simply create your own design using the new Custom Photo Mount cards from the Gallery Collection. Do you have a specific picture you would like to turn into an elegant Holiday card? Save yourself the stress of running to the store and printing out the pictures, and then finding the right card and scribbling a somewhat personal message inside every single one. That’s just too much work. No more worrying about finding the perfect card because now you can create your perfect card! What a great product! I have a nice photo to use so I’ll definitely be looking into ordering these for our Holiday cards. I am definitely planning on my engagement party thank you cards to be done with a group photo of our families. You mention these cards for the holidays but I like the idea of using them for baby announcements, graduation, etc. Your cards are much more elegant than the other websites’ cards. I’m proud to send out these photo cards for the Holidays. Having the ability to have your name, company or individual, shown on the front of the card is really great. Instant recognition by the recipient and all others who view the card on display! These are such great quality too. I ordered a set for my business and my personal cards for Christmas last year. They were impressive looking. We took a group shot for Christmas and sent that out as our card. It was a good way to put a face to everyone the clients speak with on the phone and over e-mail. Photo mounting is a great feature especially for family cards.